? EASY TO BE HEARD - Super loud whistles with over 100 Decibels guaranteed, allows you to command attention from half a mile with just a soft blow!
? FITS ANY NECK SIZE - Stylish break away 19 black & white lanyards with adjustment ball for a comfortable fit around your neck!
? SUPERIOR VALUE PACK - Made of high quality lightweight brass metal with an inside cork pea ball, it features a highly bold crisp sound!
? TAKE IT ANYWHERE - The soft adjustable strings can be removed and the whistle can be easily attached to a keychain for a fast & easy transport!
? RISK FREE TRIAL - 90 day Money Back Guarantee and Superior Packaging make the 2 pack a great Sporting event giveaway, Birthday Present or GIFT! Take advantage of a great DEAL for this high quality combo! No matter what sport you coach or any emergency may appear, the RunTasty whistle features a bold, crisp sound every single time. The whistles come with black & white lanyards, so you don't have to worry about loosing it, or finding a place to put it during a game. 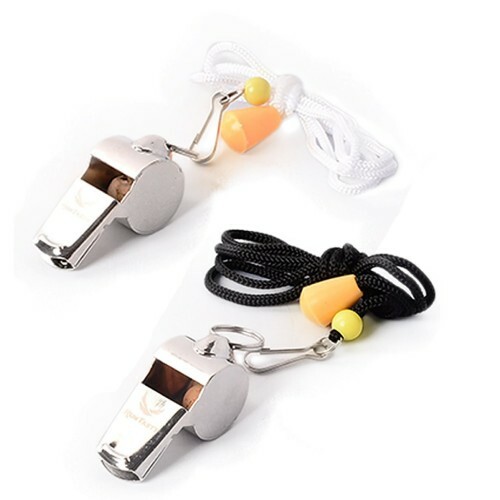 To ensure longtime usage, our whistles are made from a high-quality lightweight brass metal that is impact resistant, drop-proof and crack-free. Additionally, the gold adjustable ball on each lanyard acts as a counter balance that helps maintain the whistle's position during physical activities. The RunTasty whistles also make great giveaways at sporting events. How about COMMANDING ATTENTION in no time, helping you stay SAFE and easily make yourself heard, all in the same time? Runtasty's award winning Premium whistle pack is your trusted companion when you need to get attention. As a coach, referee or teacher, lifeguard or simply in an emergency situation, we GUARANTEE that you'll be heard! Main Product Benefits that you'll SIMPLY LOVE: ? LIGHTWEIGHT - Weighing only 0.2 ounces you can take it anywhere! ? VERY LOUD - With over 100 Db when blowing softly, it ensures that you will be easily noticed! ? FULLY ADJUSTABLE - The whistles are equipped with high quality black & white strings with gold balls for easy adjustments! ? 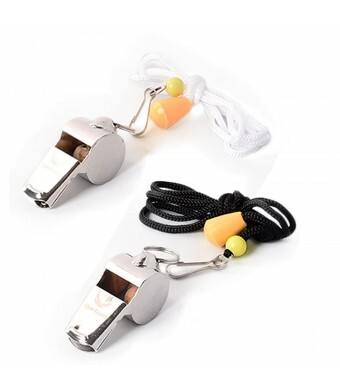 GREAT VALUE PACK - you get two quality whistles - one for you and one for a loved one. This is an excellent small gift idea! ? 90 DAY MONEY BACK GUARANTEE - Risk-free. Keep it only if YOU LIKE IT! What are you waiting for? Click the Add to Cart Button NOW. Limited Time Offer till we're out of stock!